Sharing towels causes infections. For your health and fitness - stop sharing towels. Whether it is in the home or or gym or in a hotel - using someone else's towel can lead to catching an infection or disease that will cost you more than just being uncomfortable for a while. Bath towels, kitchen towels, hand towels and beach towels are great breeding grounds and/or retainers of all kinds of stuff, especially skin surface critters. It has been conclusively proven that infectious bacteria may be easily transferred in increasing varieties and numbers through sharing towels. Bath towels, kitchen towels, hand towels and beach towels all are carriers of infectious and contagious diseases. The number of bacteria on your body right now is greater than the number of people in the United States. Real dangers from infectious organisms exist in the common bathroom towel for at least 48 hours after primary contamination. Bacteria are readily transferred from one user to another through the medium of the bath towel and by sharing towels. It is a proven fact that infectious and contagious diseases are spread through sharing towels. The best way to protect your health and fitness from bacteria on bath towels is through personalized towel tags - magnetic tags - Magtagz. Health Care professionals recommend people to color code their bath towels, hand towels, kitchen towels and beach towels. Magtagz helps to prevent the spread of infections and contagious diseases through sharing bathroom towels, hand towels, kitchen towels and beach towels. Our color coded magnetically applied towel tags allow users to identify which towel is theirs quickly and avoid sharing more than someone else towel - it is the best way to protect your health and fitness. Our magnetic towel tag supports towel reuse programs in hotels and motels. Our research has found that one of the major reasons why people do not participate in towel reuse programs is because they do not know which towel is theirs and are afraid of catching an infection or contagious diseases from sharing towels. We have found that when people know which towel is theirs they reuse their towels more - saving water and laundry costs - and they replace their towels less frequently. 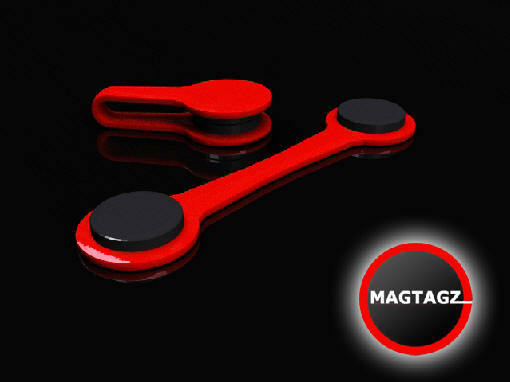 Magtagz saves you more than money! It's simply the best way to personalize your towel and protect your health and fitness. Magtagz enable you to keep your color coordinated schemes in your home without having different colored Bath towels, hand towels, kitchen towels and beach towels. Hotels that support the reuse of linen and towel programs now can supply guests with MAGTAGZ to ensure guests are provided with a safe and convenient method to determine which towel is theirs. MAGTAGZ come in a variety of colors and can be personalized with waterproof stickers to bear your personal logo or favorite graphic. Now you can have a personalized towel with a magnetic tag that expresses your personality. Getting an infection or contagious disease costs more than money. We lose more in productivity than the actual cost in treating the problem. Not only do you feel miserable you get nothing done and you pay in more ways than one. Protect your health - your health and fitness is critical to your well being. So listen to what healthcare professionals are saying about protecting your health and fitness and stop sharing towels. Towels are great breeding grounds and/or retainers of all kinds of stuff, especially skin surface critters.